Academic conferences disseminate research; they don’t engender innovation. At the Annenberg Innovation Lab, that’s not our style. We invite media executives, academic leaders, and students to explore provocative questions and create communities of innovators. We call these high-speed ideation sessions Think & Do Workshops. Established in 2011, USC’s Annenberg Innovation Lab (AIL) focuses on media, culture, and society as the basis for innovation at the intersection of art, science, design, and engineering. The lab is funded by sponsor gifts, grants and a small start up fund from USC’s Annenberg School of Communication and Journalism. Our sponsors partners include media executives, content providers, and media technologists from some of the world’s largest media, entertainment & technology companies. Our sponsors have provocative questions about their work. Our students have a need for real world experiential learning. Our faculty needs a way to connect to industries and organizations with real world problems and all of our constituents have enormous potential to unleash in service of solving the world’s most pressing concerns.. We bring these constituents together to aggregate their capability and foster innovation. Over the past three years, we have been designing an innovation process we call “Think & Do.” These six-hour workshops provide a formal but atypical ideation process through which people tackle provocative questions and develop new products and collaborations that extend beyond the day-long workshop. Universities convene conferences. They disseminate research. They don’t convene “ecosystems.” In fact, ecosystems can’t be convened. By their nature, they are organic systems communicating across permeable boundaries. AIL’s challenge then is to foster ecosystems or wide, interconnected networks of people, places, practices and processes that are capable of innovating, breaking conceptual ruts, and seeing new patterns. The media industry has been disrupted more than most. We live in an age of ubiquitous digital media. Stories flow freely across multiple platforms and corporations no longer control content. People want their news in real time on mobile screens. Yet, newsrooms, produce products to be watched on big screens at 6pm. An ingrained journalism culture prevents journalists from accepting that a good news story in the old ecosystem is not necessarily a good story today. In this increasingly complex mediascape, citizen journalists and YouTube sitcoms compete for viewer attention and further diminish the power of established media. Networked consumers spread content farther and wider than marketers ever could. While at the same time, technology companies exert increasing influence on consumer behavior and expectations. The number and diversity of players has increased. Media creation has become participative, and a 19-year-old sitting in her bedroom in Kansas, Dublin, Rio, Mumbai, or Shanghai can blow a media company’s strategy out of the water. The media ecology has changed. What started as a media industry has quickly become a hybrid media-technology industry changing the ecosystem in ways not obvious to the players. To innovate, people need to understand their changing positions in the new ecosystems. Media companies need to recognize that they are dependent on technology companies. Technology companies need to recognize the power of story. And everyone needs to meet on neutral and unfamiliar ground. The factions need a catalyst and a Switzerland. AIL is well-positioned to be both. But just getting everyone together in Switzerland doesn’t ensure a diverse conversation capable of breaking down barriers. It doesn’t create ecosystems, and it doesn’t lead to innovation. Power Dynamics: Just inviting a crowd of students, practitioners, and other experts to gather and “share” their perspectives doesn’t lead to collaboration. Power dynamics disintegrate these gatherings into show-and-tells for the same old commanding voices. For innovation to happen, these voices need to disengage from their familiar states of parallel play and come together around a common goal. Too Much Talk: Intellectual small group activities don’t work either. In a typical breakout group, after the usual hemming and hawing, a leader emerges, and a lot of talk ensues. Not much happens. But, when the group is encouraged to “do something” with their hands, bodies or imagination, information is shared, power redistributes, and productive ecosystems awaken. Think & Do’s engineer brief, playful encounters that hope to light a spark, create a community of innovators, and remix the ecosystem - an ecosystem where practitioners, faculty, and students share their expertise and mentor one another. Note: See Helpful Materials section for references. What is a Think & Do? 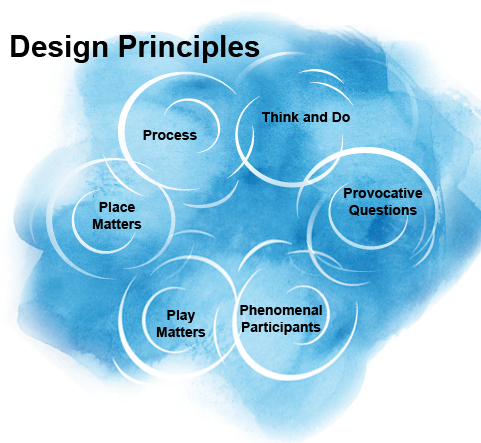 Each workshop is different, but all T&Ds are based on 5 design principles: Provocative questions, Phenomenal participants, Play matters, Place matters, and the view that innovation and change are a Process. The unique time and space that each Think & Do offers – away from work and void of hierarchy – allows participants to ponder critical questions. Much like the process of scenario planning utilized by Shell International and the World Economic Forum, our stakeholders-turned-play-partners are invited to suspend all disbelief as they scour their collective imaginations in response to our provocative yet grounded questions. These questions provide a framework for the day, a loose structure that sets boundaries and brings focus. Then we asked them about the trends in news consumption and information dissemination. We asked them to think as consumers, not producers. We asked them to look five to seven years into the future, a time horizon that’s “short enough to create scenarios that are probable, but long enough for participants to imagine that important changes with an impact on the future business can take place." (5) And then, finally, we asked them to lay out their re-invention plans. The provocative question encourages participants to rig their collective wisdom and minds in dreaming up innovative and realistic alternatives. Diversity, the sine quo non of creativity and innovation, doesn’t happen by accident. We build diverse T&D participant groups by inviting people based on their expert knowledge, their workforce role (such as roles in production, marketing, finance, etc), their level of engagement with the public, and their access to and participation in other innovation. We seek a blend of gender, race and age. We mix students and faculty from multiple disciplines with experts from multiple industries. If we’re talking about the future of the evening news, for example, we include not only content providers but also platform technologists and business executives. Often participants do not know each other when they arrive, so we spend time at the beginning of each day on introductions linking the participants to the topic of the day. For example, in the Future of Play T&D, we encouraged everyone to bring their favorite childhood toy and share their most meaningful play experience. Play fosters innovative thinking, (6) and physical activity promotes mental acuity. (7) Paradoxically, hard work can sabotage success by overpowering a problem rather than actually solving it. (8) We build on these facts as we design our Think & Do Workshops. By “play,” we mean any activity in which the imagination gets involved. Because of the profound effect of physical engagement on mental acuity, we ground the play in activities that involve other senses: acting, drawing, building, or singing. We ban PowerPoint presentations. When our T&D participants play together, they get to know each other and come to trust each other. We can’t expect in a six-hour day for complex projects to fully emerge. By the end of the day, though, relationships solidify, and concrete projectsbegin to incubate. The lab provides participants a safe and supportive space where it's "OK to play." A Think & Do is meant to be an innovation sabbatical, and we make sure space and time is available so participants can grab a chair and a few other people and discover common interests. We also fill the space with objects, texts, and sounds that serve as an information-rich, interactive, thought-provoking cocoon from which participants hatch collaborative projects and research. And rather than having the place be in only one room, we encourage movement and action by offering multiple places for activities, giving us opportunities to re-stage and create a variety of environments to excite the senses. The unstructured moments of a Think & Do are just as important as the structured, and we want participants to be able to wander and browse whenever they have a few minutes to themselves. As the Chief Culture Officers (10) of each Think & Do, we design the spaces to support a “culture of innovation.” Like the learning environment described by Kolb and Kolb, we strive for “a hospitable, welcoming space characterized by mutual respect. It needs to be safe and supportive, but also challenging.” (11) Immersing participants in this culture allows them to free their thinking and become outrageous. We do everything we can to make the environment comfortable and to prepare participants for the experience. Nevertheless, to be frank, some participants leave early because the event is outside their comfort zone. We’re not bothered by this. We are developing the sourdough starter for innovation culture, a collaborative group who can ignite others. If a culture of innovation can be understood both as “the shared beliefs, customs, practices, and social behavior of a group and … as the growth of biological material in a nutrient-rich medium,” (12) we take care to provide a nutrient rich environment in an effort to grow an ecosystem. We believe that innovations emerge and take root in iterative stages. Agile in our process, we encourage T&D participants to re-work and combine good ideas until they form prototypes. Then, with time, the prototypes can evolve into reliable, great, and eventually world-changing products or services. That evolution takes time, so we treat a Think & Do Workshop not as a means to create an innovation but rather as an opportunity to set a process in motion. Throughout the process, we encourage rapid prototyping and have frequently observed participants in discussions share: "Oh, that idea's already happened!" or "Here's why that idea won't work...” Part of the value of the diverse ecosystem of innovators at a Think & Do is that it allows for this rapid feedback process. We prime our participants for the process with a provocative question and a short briefing book full of quotes and statistics relating to the question. In the workshop, we first come to consensus about the provocative question, agreeing to frequently modify it as the day unfolds. We then focus on ideation, improving ideas, pitching, draft prototyping, and collaboration matchmaking. Finally, we incubate the new collaborations, by hosting follow-up workshops, making introductions, and contributing resources when we can. We work with our Think & Do participants not just while they’re sprinting through six hours of engagement with a provocative question. We meet mile after mile as they run their marathon, offering advice, encouragement, and bananas for sustenance. 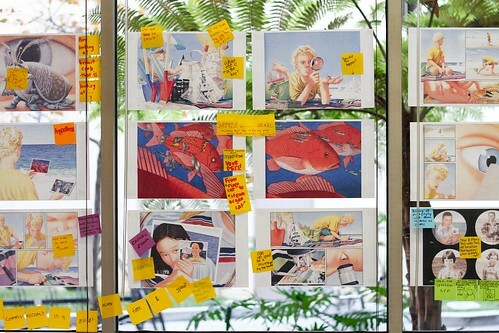 In a one day, six-hour workshop, the “Do” part of the Think & Do is the hardest to design. However, it is the most important part of moving away from the “all talk, no action” often ascribed to this type of event. The “doing” breaks down the barriers, allowing information to flow throughout the ecosystem. At the core of our methodology are short creative actions, which we refer to as “spark” activities, designed to springboard creativity. These often require groups to “build” something – to tell a story, create a metaphor, design a model, or prototype an actual product. While “sparking,” the tenor of the group switches; new voices are heard; new ideas are born; laughter fills the air; body language relaxes; and new patterns emerge. Over the past two years, we have hosted four T&Ds: The Future of Play, Second Screen: So What?, The Future of the Evening News, and Defining Transmedia Branding. To give you a flavor for the process, we discuss two of these in detail below. We’ll call on all four of the workshops as we discuss the lessons learned. Just as the digital age has changed the way we work, it has also changed the way children play. Questions like What holds children’s attention?, How does “digital play” impact children’s cognitive development?, How will stories be told in the future?, How will lessons be learned? and others continue to perplex educators, media researchers, and toy makers alike. To ensure an eclectic mix of participants, we invited the founders of The Alchemists (a transmedia storytelling company that produces and manages stories across multiple media platforms), the head of educational product development for a major technology company, a specialist in 3D graphics, game designers, and a handful of students and faculty with interests in transmedia storytelling, media innovation, the impact of media on physical spaces, learning, child development, peer interaction, and engagement between children and adults. We then set about designing the day. We carefully curated the room. Each corner represented a different form of play. We moved from art to physical play, from fantasy to construction, from physical to cerebral. Each corner contained toys, books, games and other artifacts of contemporary play. We surmised that connecting the day to the participants’ personal experience would be key, so, as way of introduction, each participant arrived carrying an object reminiscent of their own early childhood play experience. Throughout the day, participants moved around the room, sometimes in unstructured activities and other times in activities designed to synthesize what they had learned. 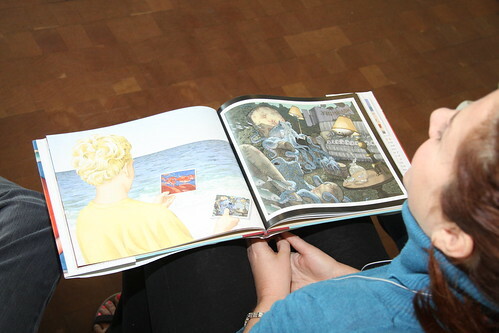 Among the items that most attracted the group’s attention was Flotsam, a Caldecott Award winning wordless picture book beautifully illustrated with pictures of underwater life. The book chronicles the travels of a magical underwater camera as it washes up from shore to shore. This mesmerizing book attracted attention as several people, stimulated by the exquisite graphics, began to create their own stories. Bringing their varied expertise to bear, the group began to imagine ways to morph this asset into compelling 21st century play. Excitement grew as a multi-organizational subset of the T&D participants committed to carry a project forward. One of the original T&D participants mentioned that she knew someone at Flotsam’s publishing company. A core group from the original T&D met with that person, who, in turn, introduced the Lab to David Wiesner, the book’s author. 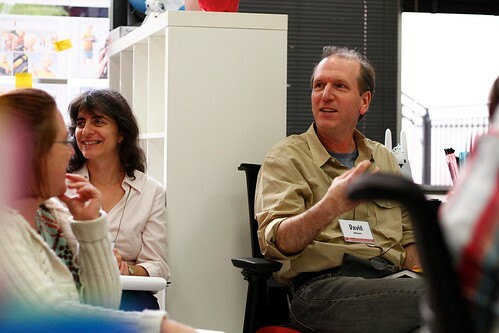 Mr. Wiesner, excited by the possibility of expanding the Flotsam world through new forms of media, admired the group’s eclectic expertise and their desire to bring a new generation of readers to Flotsam. As interest in the project grew, the Lab began developing additional workshops and a network of industry professionals, faculty, and students, with the goal of deconstructing the book and thinking about it as a transmedia story and play experience. The network not only included David Weiser and his editor but also marine biologists from The Wrigley Institute for Environment Studies, engineers from the Viterbi School of Engineering, a variety of students from the Annenberg School for Communication and Journalism, the School of Cinematic Arts, the Rossier School of Education, as well as transmedia storytelling and production professionals, including members from The Alchemists. Working in collaboration, the project team has brainstormed, researched, and rapid-prototyped numerous transmedia extensions of Flotsam. In its current iteration, the transmedia experience extends from the printed book to a dynamic book (or “d-book”) for the iPad that invites children to explore their immediate environment and the larger world using integrated interactive tools, to record and remix their own stories, and to share those stories with their friends and families. In addition to the d-book, the transmedia experience includes collectable “Explorer Cards” that elaborate on elements of the book’s illustrations and related scientific concepts and interact with the d-book through augmented reality. Play with the explorer cards can also happen outside of the d-book through a multi-player card game. The project is currently in Beta development and testing and the team envisions this experiment to release this Spring 2013 and extend beyond this one story to offering a transmedia story and play platform for multiple stories to come. The story above is true, but, it doesn’t tell the whole story. This project began when a major toy company approached the Lab looking to extend the use of an existing property. The company, tracking the expansion of transmedia storytelling saw potential for expanding its market. Partnering with the company, the T&D Team designed a one-day workshop. After settling on a provocative question, we hit an impasse with the toy company: Who would own the product of the workshop? As is frequently the case, conflict begets clarity and solidifies identity. We never envisioned subcontracting our services to one corporation, unless it was for a specific directed research grant, and this was not that. Our interests lie in “open space” collaboration, pushing the boundaries of innovation, collaborating across multiple entities. We began to see ourselves as “Switzerland” ensuring that everything remained open for exploration and co-creation, especially with regards to our T&D process and outputs. By the time the original sponsor found our conditions untenable, we considered this too important an area of research and design to cancel. The original sponsor declined to be part of our new approach (partially due to ownership questions and partially due to their own internal re-organization), so the Lab funded and organized the entire event. The first USC Think & Do shifted focus from thinking to doing, and, as we hoped it would, spawned a very real and so far very successful project: Flotsam, an immersive transmedia play experience, as well as new publications on the practices of designing Transmedia Play experiences. And, most importantly, a subset of the original Think & Do participants continue to carry the project forward today, and a vibrant network of collaborators has formed around the project. "If the television news show were reinvented today, what would it look like and how would we engage the audience?" When we first shared the Workshop’s name, The Future of the Evening News, outside our design group, someone asked if it was an oxymoron. When we heard that question, we knew we had identified a provocative topic. In the end, a series of provocative questions centering on a reinvented news show shaped the T&D. Gabe’s extensive network of news professionals brought a wide array of phenomenal participants, including old and new media executives, content providers, technology specialists, and newscasters, as well as USC Journalism faculty and students. The morning began with individual introductions on how they choose to consume the news and a brief activity asking participants what’s working and what isn’t about the evening news. Following these activities, we began to play. We asked participants to focus on the end user’s experience. We assigned groups of participants typical “habitats” for news consumption, including a bus station, an office, a kitchen, and a living room. The space had been carefully curated to include each of these habitats. So, for example, a living room was set up by borrowing sofas and chairs from the Dean’s foyer. Role playing different consumers within these habitats, participants created skits representing the likely evolution of future news consumption. After a day that included role-play, an activity asking participants to mock-up a re-imagined daily news program,a period of unstructured networking, and some great rapid-fire product pitches from participants, the T&D yielded a collaboration between USC’s Institute for Creative Technologies (ICT), a major broadcaster, a leading network technology company, and the Innovation Lab. The project seeks to marry ICT’s holographic avatar technology with the broadcaster’s news assets to deliver a personalized video news experience. Again, the above story makes the process seem smoother than it was. A few days before the event, we realized we were understaffed to facilitate the event, move props, and hang flip charts. Fortunately, the semester had just begun, and Susan was able to recruit a few of her students. Having a detailed facilitators’ guide helped the students get up to speed quickly.In one activity, we assigned people from similar industries to the same group, and the result was a grumpy group of participants who let us know they came to meet a diverse group of people, not more like themselves. The news habitat “spark” activity had a slow start. As it turns out, news folks tend to be skeptics, and it took time to cajole some of the participants to attempt the first “habitat” activity. We could have used an experienced facilitator in each group to guide the participants. Luckily, there were some “positive deviants” in the living room habitat who broke the ice by presenting a skit that had us all on the floor laughing. Toward the end of the day, time became very tight, but, fortunately, Gabe Kahn, our subject matter expert, and Jon Taplin, the Lab’s director knew many of the participants and did some critical matchmaking. A number of other projects might have emerged, but we didn’t have the staffing to manage them. A listserv started by one of the participants got a lot of play for a few weeks following the event but died soon after. We have learned an enormous amount from our initial Think & Do’s. We had moments of great success and humbling moments as well. And we feel confident that our future events will benefit greatly from our experience. A brief 6-hour workshop entices overextended “phenomenal participants” to attend but challenges session designers. Solution: We have learned to keep the scope of the day in mind. We seek to pique interest, build relationships, and initiate collaboration. Expecting more than this sets the event up for failure. To do this, we provide a balance between presentations and small group “spark” activities. We learned this lesson in our Second Screen T&D, when we had too many participants and too many technology presentations, forcing us to set up theater-style seating and limiting time for breakout sessions. It is also important that we do not over-program (a mistake we have made more than once), so we facilitate to a loosely designed agenda and prepare ourselves to improvise. We keep the time cue light and playful, generally using an iPad piano as a timekeeper. And we provide a balance between assigning participants to groups and leaving breakout sessions totally unstructured throughout the day, for we’ve found that assigned groups work best at the beginning of the day when people are still getting to know each other and what each offers. It is difficult to translate problems and messy situations into symbolic activities which facilitate meaningful, playful exploration. Solution: In the Transmedia Branding Think & Do, we had a complex set of instructions for an activity involving cardboard hexagons, glue sticks, and the potential future world events or technologies that might disrupt the branding industry. As we wrote out a whole page of directions for the 20-minute activity, we realized this was overly complex. We had neglected to ask ourselves, “Will this get us where we want to go?” Now, when designing activities, we ask ourselves that question right away. We’ve learned to let go of pet ideas if the answer is no. We push ourselves to not just develop activity ideas but also develop prototype activities and test them out. Innovating activities takes the same discipline and rapid prototyping as any other innovation. We are in the process of identifying key attributes of successful activities. Just because six people from different areas of expertise are working together does not mean they are a team. Solution: Design teams, like other teams, require development, and development takes time. Clarifying roles and responsibilities at the beginning of the process helps. Also, limiting the size of the team to five or six members, at least initially, helps the project develop a common direction in a shorter amount of time. Staying small helps us remain nimble and flexible and provides more time to negotiate a common language. This challenge has two dimensions. Participants are reluctant to share proprietary technologies with competitors, and, as we learned from the feedback we’ve gathered, participants are reluctant to come to events that they think are solely for the benefit of the Lab. Solution: We have to expect this challenge and clarify the intent of the Think & Do before the event and again during the event. We have to be clear that we are acting as Switzerland, that problems posed in a Think & Do are large in scope and can be viewed and addressed through multiple lenses, and that the Lab is a place to look for cooperation and collaborations among partners. Some organizations will choose not to participate, and that’s ok, but it’s critical to be clear upfront. Nurturing networks takes time and energy. After a while, the high created during the Think & Do dissipates, and participants lose interest. There are no formal hierarchies or structures binding us together, especially at the beginning of a project when we are all volunteers and want to be entrepreneurs. Solution: To stay involved, people need to know their contributions matter, that they are part of something, and that there are tangible benefits as well. We must assure our external partners that there is potential for financial returns when products launch. We must provide opportunities for students to participate in real world applications and interact with a rich network of potential employers. We must help faculty fund the research that grows out of T&Ds. Another thing that keeps people involved is the culture of the Lab. We constantly reach out to people who have participated in workshops, inviting them to speak at or attend other events, introducing and re-introducing them to each other, and keeping them involved in dynamic projects. Two notable networks emerged from the Transmedia Branding Think & Do. Henry Jenkins and Burghardt Tenderich will co-teach a course on transmedia branding this spring, and several participants from the T&D have agreed to guest lecture or otherwise contribute to the success of the course. The course plan is to produce a range of online products, and it pairs students with T&D participants, thus extending the network to a still larger group. Burghardt Tenderich, the subject matter expert from the Transmedia Branding T&D has done an excellent job communicating with participants of the T&D, keeping them informed about opportunities for involvement. Another network to emerge from this T&D centers on technology. AIL Creative / Research Director, Erin Reilly has designed and developed the PLAYground, a new social network for ideation and collaboration in the enterprise. We think this could address seeding the conversation between phenomenal participants before the T&D. Currently, the platform is being beta tested by a network from the Transmedia Branding T&D. In addition to measuring the number and ultimate effectiveness of these activities, we gather feedback on the workshops and the process, both formally through a survey and informally through “hallway conversation” and observation of network activity and longevity. One way to measure our progress is to watch networks develop. Following the transmedia branding T&D, we have made a concerted effort to nurture the network, and thus far two notable projects have emerged: one around a class and the other around technology. The Flotsam network has grown considerably, expanding from a core group of 5 to 30. The news avatar project is still in its infancy, but it has brought together 4 organizations and hopes to add another this spring. We now have a standard post-event evaluation form, which assesses the effectiveness of each activity as well as the desire of participants to attend future Think & Do’s. On a scale of 1-5, 100% of participants have responded that they are very likely (4) or extremely likely (5) to participate in future workshops. Decide if a “Think & Do” is right for you: T&Ds pull together folks from diverse disciplines and roles. We use them to innovate ALL KINDS OF projects and processes. You might organize a T&D as you develop collaborative community CSR initiatives. Or, if you are a city or municipality, a T&D might help you initiate an urban renewal effort. Clarify purpose and expectations: T&Ds work well with diverse participants and limited time. It’s important to clarify amongst both the designers and the participants that the workshop is only the very beginning of a process of innovation. The participants who buy into that process are the participants who will serve the project best in the long run. Develop a design team: The team should include one or two subject matter experts, a process expert familiar with large group change technologies, and a representative or two from constituents of the innovation. The team may be expanded after the direction is set to include sub-teams from subject matter experts and event facilitators. Start small: It is much easier to manage a group of 20 than 40 people. There is also more airtime for each person. 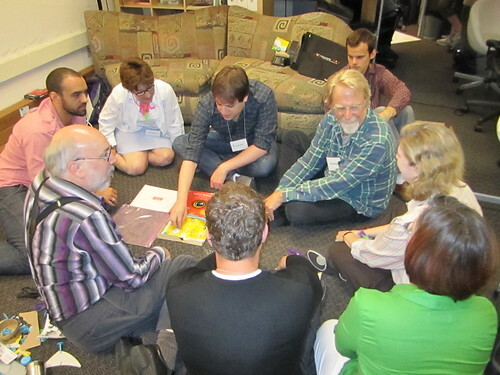 Developing “playful simulations” which focus the group on the task and issues at hand takes practice, and, with a small group, it is easier to make mid-workshop corrections. Develop a briefing book: The short document should contain the focal question, a list of workshop participants, background information on the subject matter, examples of state of the art innovations, a brief description of the T&D, and a loosely scheduled agenda for the day. The briefing book helps participants prepare for the day, and developing it helps you design it. If you want see some example briefing books, here are the documents we passed around in advance of the Play T&D, the TV News T&D, and the Transmedia Branding T&D. Send out invitations setting expectations: Participants will want to know a bit about the day, the purpose, the focal question, and timing, specifically when the day will begin, when they’ll have breaks, and when the day will end. When you send that information out is a good time to set expectations for ownership and desired outcomes. Plan how you will keep the “network” or projects going after the event: Planning includes not only choosing a technology platform but also staffing to support the network and maintain the platform. In addition, providing initial project management eases the transition from a good idea to a great project. Decide on how you will resource the effort before the session. If you don’t have the resources for follow up, find them or cancel the event. Develop a “facilitator’s guide:” The guide should include an agenda, timing of the activities, and activity instructions. The guide will help keep everyone involved in managing the T&D on the same page. If you want to see some example guides, here are the documents we used for the Play T&D, the TV News T&D, and the Transmedia Branding T&D. Have fun! This is important. Albert Einstein once said, “We cannot solve our problems with the same level of thinking that created them.” Nor can we solve them by ourselves. At USC’s Annenberg Innovation Lab, we bring diverse communities together to provoke innovation, build networks, and create the future at the intersection of art, science and engineering. Like the MIX, we are shooting for the moon - unleashing capability, fostering renewal, expanding minds, and distributing power. One piece of our effort is our Think & Do process, an ideation process designed to break down barriers, spark creativity, and build relationships. Because we live in a university, we play on the edges of several ecosystems. We see ourselves as connectors, positioned to provide a safe place to gather and collaborate. When we host a Think & Do, we transform the Lab and the area around it, creating a “pop up” culture, a nutrient rich medium in which to plant the seeds of innovation. If the MIX and the innovation revolution have taught us anything, it is that there are many paths to innovation. Some work well within one organization. Others work best between organizations. A driving force of our success is the diversity of our participants and their willingness to share their knowledge. It’s this colliding of different perspectives in a relaxed, collaborative environment that creates value. We would welcome the opportunity to experiment with this design in new situations. However, our approach may or may not work within a single organization, an entity bounded by a hierarchical culture and beholden to what Gary Hamel eloquently labeled “scaffolding of 20th century management principles.” For the process to work there, other things in the organization may need to change first. Given the fast pace of the world today ... creativity and experimentation must be quicker and more agile than traditional, heavy innovation mechanisms allow. A lighter, more agile mechanism is called for … where the organizational structure is light, emergent, networked, and elastic. Get people together, mix it up, use Play and humor to flatten hierarchies and break down power barriers. View innovation as a Process. Regular participation in our T&D Workshops is something we now consider a key benefit we provide our sponsors, among which are some of the world’s top media, entertainment, and technology companies. Over the three years we have been developing this process we have seen relationships grow across the media ecology amongst our sponsors, small media companies, our students, and faculty. Our process has also gained enough exposure that other companies and nonprofit organizations have asked us to personalize T&Ds for their networks. This increased interest has pushed us to start work on an e-workbook to be released Fall 2014. The book will further define our 5 Ps and offer a toolkit of activities that we hope will help people organize and facilitate their own Think & Dos. Since last January, we have honed our methods and thrown our nets wider, continuing our interdisciplinary work and expanding our process to help individual companies and organizations ideate and innovate. In the past year we have convened 2 additional cross-disciplinary Think and Dos, focusing them on provocative questions related to the future of media and entertainment. Re-Envisioning the Home TV Experience from USC Annenberg Innovation Lab on Vimeo. Provocation: What defines the amplified experience of home television entertainment? Participants included executives from the TV business and strategy side; creators and producers experimenting with content; user experience designers and developers; “wild cards” with an early appetite for reinventing, repackaging and enhancing the TV viewing experience; and USC professors, staff and students. Everyone shared their best TV experience; mapped a typical 24-hours of viewing by a fictional TV viewer; discussed the shortfalls of our current home TV experiences; experimented with new technologies like Google Glass, Oculus Rift, 3D Printing and tablet experiences, to think about how these could add to or create new TV experience. AIL Think & Do Workshop: Recap - Business Models in an All Mobile Environment from USC Annenberg Innovation Lab on Vimeo. Provocation: How can we create new business models for the media & entertainment sector to take advantage of an emerging all-mobile environment? Participants included Media & Entertainment executives, “wild cards” and USC professors, staff and students. Everyone shared the most interesting way they had used their mobile device; brainstormed ways to address current business problems with emerging mobile solutions; refined those solutions by incorporating some core principles for creating value for business and the consumer. We believe the Information Economy is being replaced by a new Imagination Economy: a new global boom in which the rise of ubiquitous, natural, and affordable technology, the rise of participatory culture and the new “maker” movement, coupled with the rise of a 3.5 billion user global broadband distribution platform, and the rise of a rapidly growing global middle class converge to reshape the media and entertainment industries—and quite possibly every other industry as well. The two new Think & Do events mentioned above are part of our participatory design research agenda identifying how media and entertainment companies can reorient themselves to flourish in an emerging Imagination Economy. By extending the Think and Do ideations into action, our approach responds to the challenge, “How can we tap into emerging digital technologies and the principles that undergird them (such as transparency, collaboration, meritocracy, open­ness, commu­nity and self-determination) to imagine the future of business?” To extend the one-day experience we establish working groups and build on-going networks through social media. Since many T&D participants are not local, technology such as telepresence, skype and google hangout facilitate their ongoing involvement. Second Screen from USC Annenberg Innovation Lab on Vimeo. Provocative question: How do we connect the notion of “frontier” to global stories and spark a multicultural conversation amongst a new generation of consumers. We asked the question, “How will this new generation pave their own definition of pioneering a new frontier–what does that mean to them?” “How can the company connect the campaign to their origin story? Participants: 20 people including a few of the lab’s research fellows, members of the company’s value chain, as well as the creative team running the program. We laid the groundwork for three key transmedia strategy pillars and brainstormed tangible deliverables. These deliverables incorporated an awareness of a more globally inclusive world. By the end of the day, we had seeded a transmedia strategy for the brand campaign that impacted both the bottom line and global equity. Provocation: What are the branding and image challenges faced by this company? Participants: All levels of the company from full participation of the CEO, to the Creative Director, to the social media assistant. Our goal was to create an equal creative playing field for all voices to contribute and feel as if their contribution mattered. We ended the day with a draft transmedia brand map for the company to use as it further refined their campaign. Provocation: How do we build a better arts press? The importance of initial introductions. The opening introductions can be an incredibly effective community-building activity. As a result, we have increased our emphasis on making intros memorable. With such a diverse group of people, creative introductions give everyone 45 seconds of fame: a moment to position and equalize before leaving egos behind. Think and Dos start with participants introducing themselves to the entire group by sharing a personal experience related to the day’s topic. For example, at the Future of the Arts Press Think & Do, all participants introduced themselves by recollecting their first creative act. At New Business Models in an All Mobile Environment, participants shared their most novel use of a mobile device in the previous week. Some folks got unlost with geolocation and mapping; others found their cars; and still others used the device to downsize their possessions. The power of Wild Cards, or people who seemingly don’t fit the model of other participants. For example, we invited a Red Bull executive to the Future of the Arts Press Think & Do. We’ve found that people who don’t initially seem to belong in a room often very quickly help all the belongers see their problems and opportunities from important new angels. The importance of laying out the framework for the provocative question before folks arrive. Finding the right balance of enough but not too much information was the biggest learning process for the briefing books (many linked above in the different Think & Do’s we mention). The briefing book offers a place to curate and make explicit information that help formulate the provocative question that guides the day. Fishbowl Discussions that happen in the middle of the room, unlike “expert panels” on stage, anyone can participate and members can freely tap in and out of the discussions. This “model of engagement emphasizes the power of the individual over command and control”. A Day in the Life creates a temporal understanding of how a product, process or policy impacts specific stakeholders. The importance of FLIPping at the end of the day. FLIPping is Fast, Lean Implementation Planning. Without this activity, the energy of the day quickly dissipates, and people leave having enjoyed themselves but not having committed to staying involved in the “process” of innovation. Each Think & Do is a springboard into a process of innovation with impact. The events are wonderful sparks, the challenge remains to fan the flame and maintain the networks beyond the one-day event. We’re having some success and look forward to the community’s feedback to move us to the next level of understanding this new way of working. Our process stands on the shoulders of many innovators and change agents before us. We thank IDEO for teaching us to empathize with the end user, Positive Deviance for reminding us that the solutions reside in thinking through making, Appreciative Inquiry and Decision Accelerators for teaching us to manage large-scale change with both a positive and strategic perspective. We also thank Director Jonathan Taplin and Dean Ernie Wilson for having the tenacity, perseverance, and spirit to found AIL and Henry Jenkins, Chief Advisor of the lab, for his unwavering support and his groundbreaking work on participatory culture and the knowledge that innovations reside in fostering community. Finally, we thank the people who have participated in our Think & Do Workshops for teaching us about our process, expanding our networks, and having the courage to abandon assumptions in service of changing and innovating cooperatively rather than competitively. 3. A. Singhal, K. Greiner, & L. Dura, “Positive deviance makes inroads into health care,”in A. Singhal, P. Buscell, & C. Lindberg (Eds. ), Inviting Everyone: Healing Health Care Through Positive Deviance (CreateSpace, 2010). Herr-Stephenson, B., Alper, M. with Reilly, E. (2013 forthcoming) T is for Transmedia: Learning through Transmedia Play. Annenberg Innovation Lab and the Joan Ganz Cooney Center. Thanks to everyone who has commented on our story! Based on your collective insights we finalized our application. We have by no means finalized our learning so, please keep the feedback coming. I was privileged to attend two think and do sessions and found the format and quality of the experience a very effective way to brainstorm while meeting colleagues from other companies and in some cases competitors. We follow a similar process here at DIRECTV including rapid prototyping, testing and various warmup activities and find that this leads to great brain storming sessions . One of the secrets to success is having a diverse set of participants and viewing all ideas as legitimate even if they require tweaking to work in the real / corporate environment, I am looking forward to my next Think and DO and highly recommend the process. The "Think and Do," process I was privileged to experience at the Annenberg Lab allowed me to gain clarity of understanding as to why I so passionately believe in the constructive approach to learning. As a long time Elementary Principal I have continuously experienced the power of this type of lesson design with young students; however, did not connect the dots for adult learning environments. The group of adults I participated with during the "Think and Do" session were extremely diverse in their personal backgrounds, beliefs, practice, and professional experiences. All were dynamic people with strong opinions. The "thinkering process" allowed all of us to come at a set of provocative questions with a new set of eyes - a different vision created through doing and informal communication sprinkled with interesting "aha's" along the way. By the time we engaged in more formal group conversation, later in the day, the playing field was leveled and a feeling of collegial conversation prevailed. Kudos to the AIL Team and, hopefully, this process will gain traction and become part of regular professional practice. I had the opportunity to observe and participate in the Think & Do process both as a student at Annenberg and later as the Director of Story Development/ Chief Publishing Officer with The Alchemists, LA. In my experience, the T&D Tank proved to be a dynamic platform that brought together creative minds from both academia and the industry in search for innovative ideas that would pave the way forward for the next generation of thinkers and creators. The T&D process enabled each participant to use their unique experiences and expertise to approach a common theme which allowed for a multiplicity of perspectives. This in turn gave each of us the opportunity to unlearn some of the preconceived notions we invariably tend to acquire in the course of our education/work, so as to make room for fresh and diverse ideas and approaches. In short, the T&D process is what learning should be: fun, engaging, collaborative, relevant and productive. I think there is an important lesson in here regarding both collaboration and ecosystems. I was involved in the Think & Do about reinventing TV news. One of the challenges we face in the news business is understand its evolution. What started as a media business has become, in many respects, a tech business. Many people in the news business don't really understand how the business works anymore. Media companies now operate in a different ecosystem. They are still learning how to become good citizens in that ecosystem. However, most newsrooms are still producing a product that they think is going to be watched at 6pm on a big screen. That's not how people are consuming news. There's a disconnect. A successful story in the old ecosystem is not necessarily a good story in the new one. The t&d process can help people understand their changing position in the ecosystem by bringing media people and tech people together in a way that is not familiar to either group. Tech people think they understand media's problem, but they don't. So it's good to put both of them in a position of slight discomfort. Both players needed to meet on neutral and unfamiliar ground. Thanks for being part of the Lab's ecosytem. You've really helped me understand the media industry. As a professor and entrepreneur, I have been interested in finding ways to create new business models in SoCal industries that have been disrupted (biotech, aerospace, journalism, education). "Think and Do" makes a lot of sense as an approach to looking at a problem in new ways. I like the fact that "Think and Do" focuses on divergent thinking and "play" as a way to get participants to break out of their legacy thought patterns. I find that the left-brained thinkers I work with often resist squishy things like play because they can't control it. However, when they can see the benefits of thinking and acting in new ways, when they get out of their comfort zones, the ideas that emerge are really exciting. I am definitely going to look at how "Think and Do" can be applied in my world. Fantastic Kathy! It would be great to collaborate with you in finding ways to apply this to SoCal industries. "Think and Do" seems like an ideal process for engaging disparate people in creative problem-solving and idea generation. It forces people out of their old ways of thinking and opens their minds to new possibilities. I also like the way it levels the playing field, by removing barriers of hierarchy, status and direct competition. The "art" of play is powerful. It leads to expansion, versus contraction, and is joy-based, rather than fear-based. Journalism education needs more models like "Think and Do!" We face enormous challenges (and opportunities) during this incredible time of media disruption And we must face those challenges by being open to new possibilities and opportunities, which will require a new way of thinking and doing. We will steal this idea. Thanks Maryanne! We'll connect you to the News list-serve and see how we can extend our original News Think & Do to the questions you're interested in. I had the pleasure of helping to organize and participate in the Future of Play Think & Do tanks, and learned much from the experience. I see the Think & Do tanks as a sort of a "pop-up" kindergarten classroom for adults who both take their play seriously and seriously know how to play! As a Ph.D. student, it was a positive experience to collaborate with my professors in a playful space as equal contributors, teachers, and learners - which is all too rare in a university setting. Thanks for your comment. I've begun thinking of the Think and Do's as "pop-up" restaurants or feasts that leave participants saying yum - that's good, how do we find more! Rapid prototyping is one of the most exciting ideas in the world of innovation and entrepreneurship. It means that you can quickly develop a prototype of your new ideas, start testing it with real users typically reached via the Internet, and let the idea evolve based on user and market feedback. Rapid prototyping is enabled by advances in technology, including the Internet, design and modeling tools, cloud computing, mobile devices, etc. But, even more important is the Think-Do culture involving a holistic, integrated approach to design, development, customer experimentation and continuous feedback and evolution. The Annenberg Innovation Lab is a pioneer in applying these rapid prototyping approach to new kinds of problems like the future of play, the future of the evening news and transmedia branding. As such, it is being true to its original mission of focusing on innovation at the intersection of art, science, design and engineering. The Think & Do innovation process it has developed feels particularly suitable to address these kind of unstructured problems. It enables tapping into the ideas of a diverse group, but at the same time focusing their activities into a specific set of actions to actually get something done. Thanks Irving for your thoughtful response. You were the catalyst for the launch of the Annenberg Innovation Lab ...so following in your footsteps, we hope to spark new areas of research and practice through these Think & Do workshops. I very much enjoyed my experience during the "Transmedia Branding Think & Do Workshop". I came into the workshop with no particular expertise in either "transmedia" or "transmedia branding". However, I do have an interest and some expertise in media and media forms. Despite this background, I was fairly intimidated at the thought of working with experts in the field of transmedia - what could I contribute to the understanding of a field that was new to me? I found - to my delight - that I could indeed contribute to the shared understanding that was built during the workshop. Part of the reason was the nature of the workshop leaders and participants - who were all intellectually generous and welcoming of emergent ideas and concepts. They made it safe for me to share insights and extensions from my own perspective. Just as important, the structure of the workshop process supported the evolution of both community and knowledge-building. The small-group work developed initial sets of personal relationships we could build on throughout the event. The reporting-out process was also a creative one - participants combined theater and fun with the effective presentation of critical concepts. The larger forum built upon the foundations of the earlier group work. We continued to extend our shared understanding of a complex field in a way that was both substantive and engaging. I thoroughly enjoyed the process, and I certainly look forward to more exchanges with this community. I attended the Transmedia Branding Think & Do with exhilaration. The space seemed to have a "no holds barred" look and feel and allowed all participants the option of setting formality aside to allow creativity to fill the partial vacuum. The pipe cleaners, scissors, markers, and other tools of creativity reminded me of the days when being creative was without form or responsibility. It aptly modeled the need to play with different people in new spaces to generate unique ideas. In an era of what appears to be new found openness (as in software, online courses, etc. ), this flavor of Glasnost was powerful, entertaining, and productive. I have participated in three Think and Do Tanks and each one was a unique experience. One of the most interesting common threads was to watch how senior corporate executives plunged into the "play" aspect of the process. Ideation is hard, but I found that the progression during the day from play to really concrete actionable ideas was remarkably consistent in the three very different domains that were explored. I participated in this Transmedia Think & Do. To my surprise and delight, humor played a key role in advancing collaboration between academics and industry thought leaders. We were a diverse group of people, and humor enabled us quickly to establish common ground, a lingua franca, in which sustainable models of real-world problem solving could be built. The "wild card" guests listed above in "Lessons" kept everybody nimble. Henry Jenkins set the tone provocatively by asserting, in his informal, convivial keynote, that Occupy was the "transmedial brand of the year." That irony opened up space we exploited again and again as we grappled with tough questions about serious messaging, interactivity and ethics. This Think & Do is an exemplary template of relevant and pleasurable professional development. To Theresa's point, I think there's much from the Think & Do model AIL has provided that we can all learn about better facilitating collaboration across disciplines/perspectives. Thanks for sharing the fastcompany piece. Glad to see the network and ideas are "spreading"
This is the first really innovative idea I've seen around innovation since I started studying this work. I'd love to see what they can do to help the entrepreneurship world. I hope you can take on teaching your methods to others who are interested. Also, there's some fascinating research work to be done .. I hope you are moving in that direction. The biggest problem, to me, will be the word "play" - is the business world really ready for it? Thanks for sharing your exciting work. Thanks for your suggestions. Each time we do a "Think and Do" we learn more and more about transferring our knowledge. We hope to expand our horizons. As far as the "P" word goes... perhaps having "play" enter the work place is part of the innovation revolution. Would a smiley face be too playful here?